Trailhead: Going To The Sun Road, 1.5 miles east of Lake McDonald Lodge. 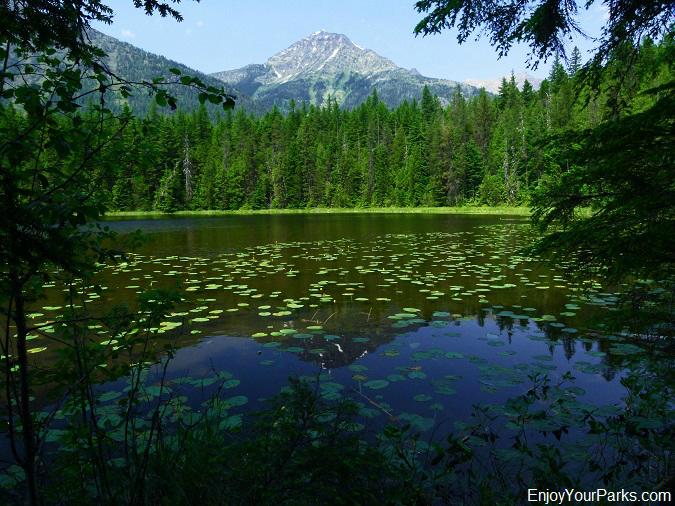 The hike around the Johns Lake Loop Trail in Glacier National Park is a pleasant 3 mile hike through lush cedar forests that provides Glacier Park hikers access to Sacred Dancing Cascade, McDonald Falls and Johns Lake. This is one of the least strenuous hikes in the Lake McDonald Area, only climbing 160 vertical feet in 3 miles. 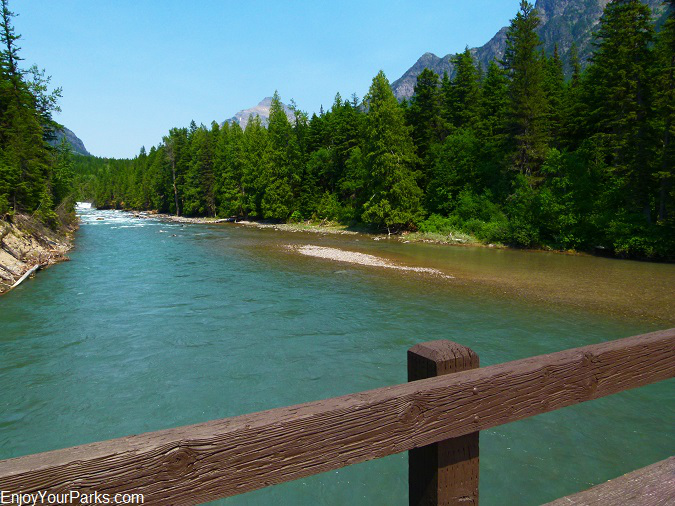 Even though the Johns Lake Loop Trail is not one of our Favorite Easy Glacier Park Hikes, it is still very pretty and is good for those Glacier Park hiking enthusiasts that do not like a lot of vertical elevation gain during their Glacier Park hiking adventures. 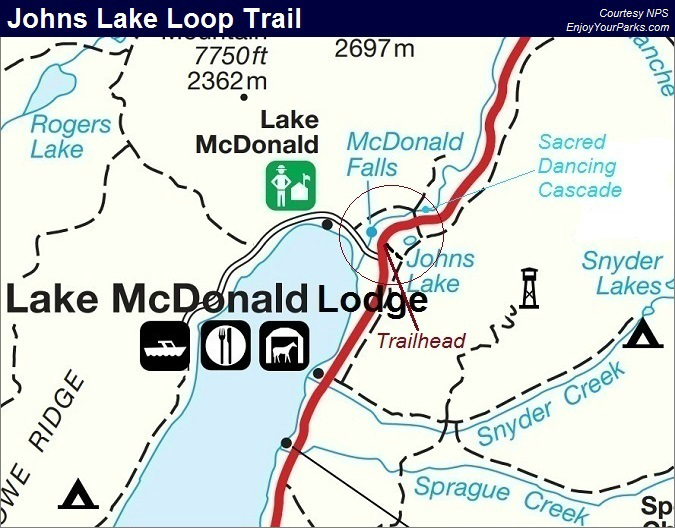 The trailhead for the Johns Lake Loop Trail is located along the west side of the Going To The Sun Road, about 1.5 miles east of Lake McDonald Lodge. The trailhead sign is on the south side of the road, and is quite obvious as you drive east along the Going To The Sun Road from Lake McDonald Lodge. For those visitors who are not hikers, It's important that you know that you can also see the Sacred Dancing Cascade from the Going To The Sun Road... which is located about a mile further up the Sun Road to the east, as well as McDonald Falls, which is located just before you reach the trailhead sign. The Johns Lake Loop Trail in Glacier National Park takes you through a lovely cedar and hemlock forest as it leaves the Going To The Sun Road. 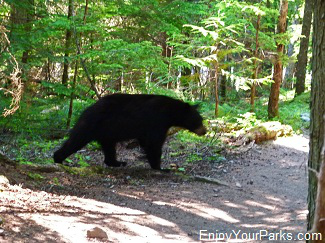 The last time we were on this Glacier Park trail, we saw this black bear within the first 5 minutes of the hike. The photo is blurry, but at least shows you the bear that crossed the trail in front of us (see photo below). Black bear on Johns Lake Loop Trail. 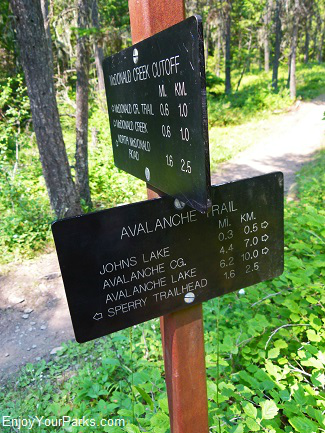 Johns Lake Loop Trail sign. 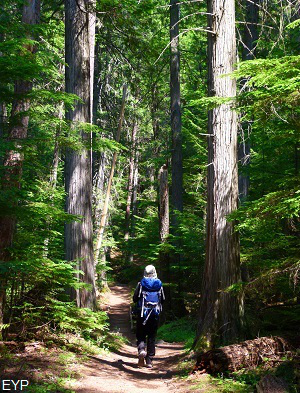 The Johns Lake Loop Trail in Glacier Park takes you through a beautiful cedar and hemlock forest. In only 0.2 miles, you will encounter the Avalanche Trail Junction. Take a left at this junction to continue onward to Johns Lake and the rest of the Johns Lake Loop Trail in Glacier National Park. 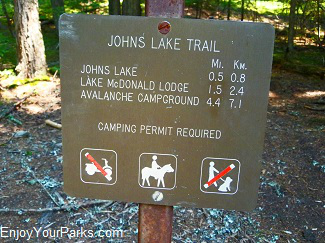 In approximately 0.3 miles from the trailhead, you will reach the shore of Johns Lake. 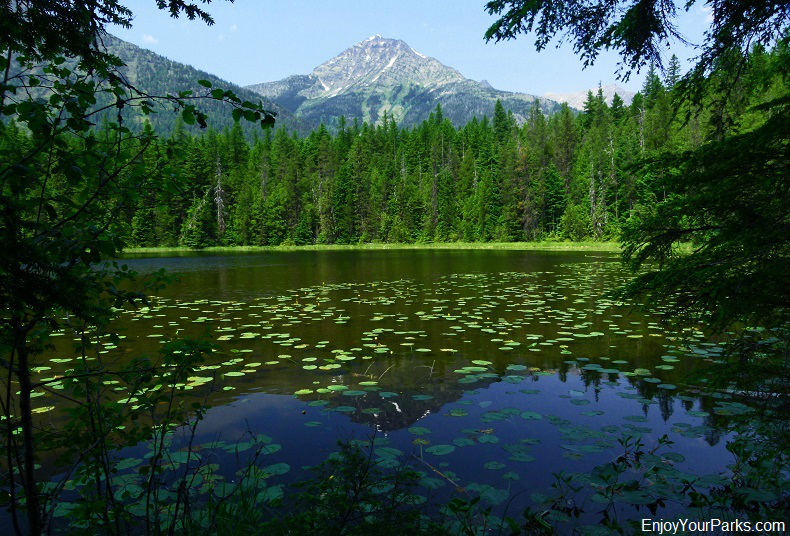 Mount Vaught and Stanton Mountain can usually be seen reflecting in this small, shallow lake that has lily pads taking over the surface. Is this the prettiest lake in Glacier National Park? Not even close. But it's on the way as you hike the Johns Lake Loop so you might as well take a look. Johns Lake with Mount Vaught in the background, along the Johns Lake Loop Trail in Glacier Park. Just beyond Johns Lake along the Johns Lake Loop Trail in Glacier National Park, you will encounter the Sun Road Connecting Trail Junction. So again, make sure you're heading for the Sun Road (which is the connecting trail) and NOT the Avalanche Trail that heads to the Avalanche Campground. 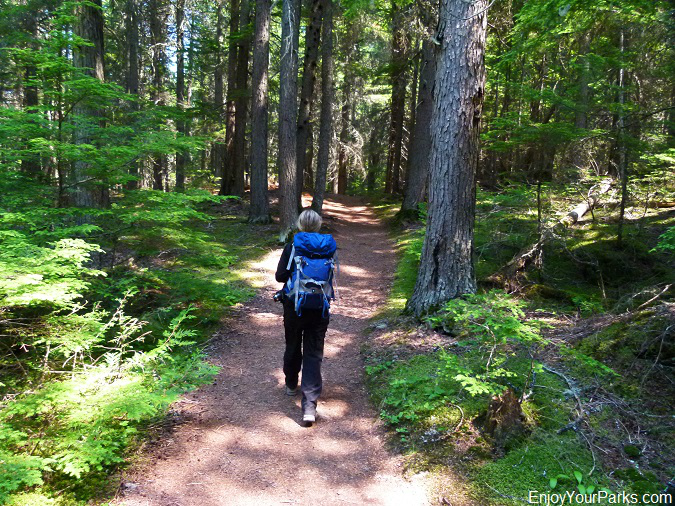 This connecting trail, which is part of the Johns Lake Loop Trail, heads northward towards the Sun Road, and will take you through a gorgeous cedar and hemlock forest that is very mossy and mystic. 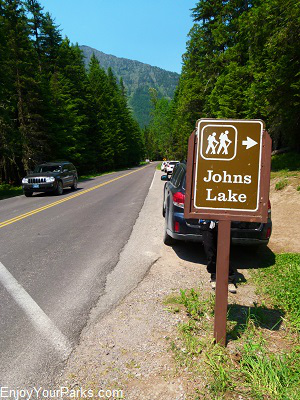 Once you reach the Going To The Sun Road along the Johns Lake Loop Trail, carefully take the cross walk to the other side of the road. There you will see the paved pathway leading to the Sacred Dancing Cascade. Sacred Dancing Cascades along the Johns Lake Loop Trail in Glacier National Park. 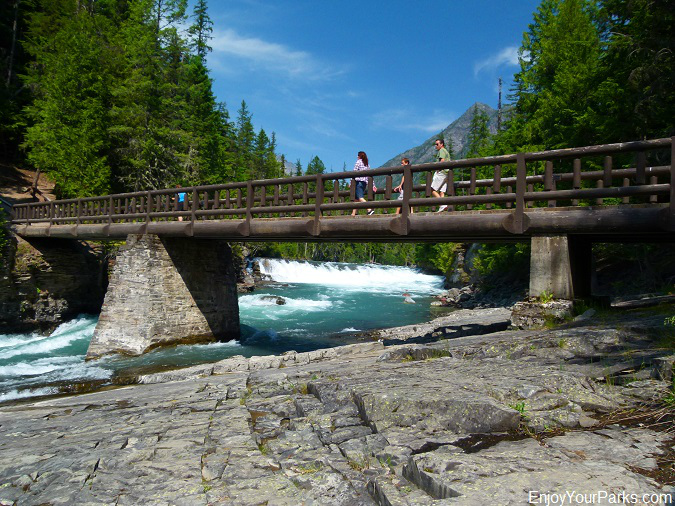 The paved pathway will take you down to the shore of McDonald Creek in Glacier National Park. Just upstream from this point (east) you will see the Sacred Dancing Cascade. Early in the summer season this cascade is really roaring and is quite amazing, but even as McDonald Creek calms down in mid to late summer, the Sacred Dancing Cascade is still very nice and worth taking the time to enjoy. McDonald Creek foot bridge near Sacred Dancing Cascade, along the Johns Lake Loop Trail in Glacier National Park. Once you cross McDonald Creek via the large foot bridge along the Johns Lake Loop Trail in Glacier National Park, you will reach the McDonald Creek Trail Junction. Make sure you take a left at this junction. 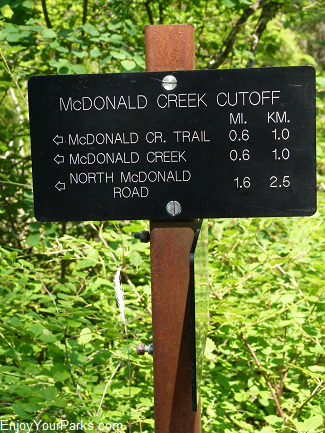 The McDonald Creek Trail will then follow McDonald Creek downstream (south) towards McDonald Falls. McDonald Falls along the Johns Lake Loop Trail, Glacier National Park. In early summer, you will hear the roar of McDonald Falls long before you see it. This amazing falls is more like a cascade than a typical water fall when McDonald Creek is full from the heavy snow melt. 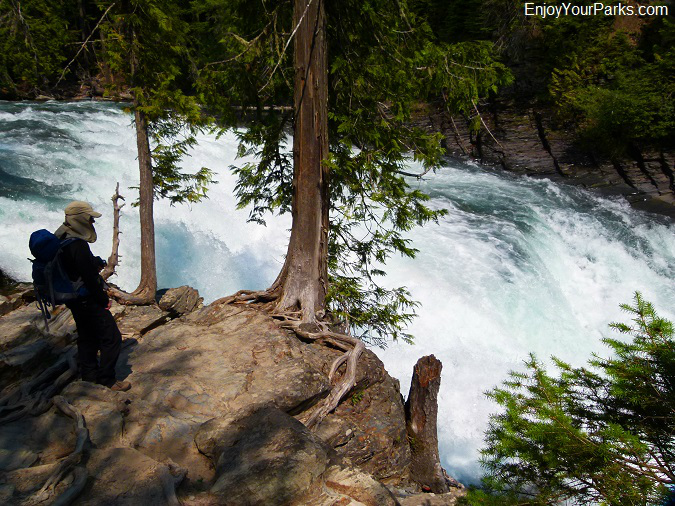 Its basically a wall of white water that has so much energy it is quite remarkable to see. Make sure you stay away from the edge, as a slip into this raging white water, especially early in the summer, would most certainly prove to be fatal. McDonald Falls are located right next to the Going To The Sun Road. The McDonald Creek Trail takes you on the other side of the falls during your Johns Lake Loop hike in Glacier National Park. 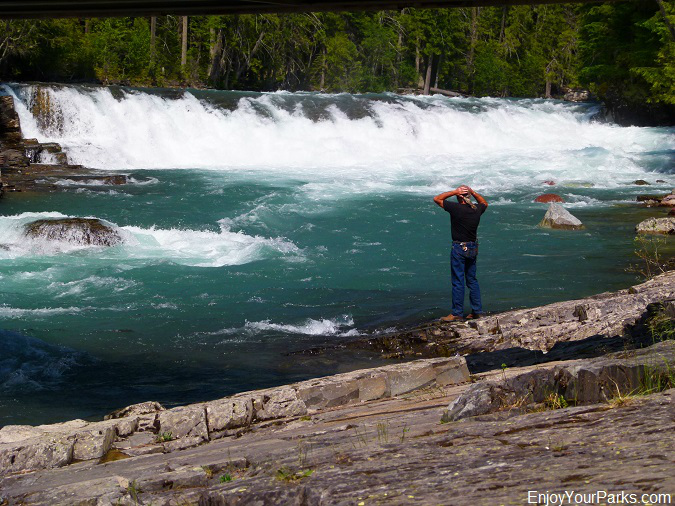 Once you're enjoyed McDonald Falls along the Johns Lake Loop Trail in Glacier National Park, continue along the trail southward through a pleasant forest until you reach the North Shore Lake McDonald Road. Take a left at this road along the well traveled horse trail. You will then cross McDonald Creek on a large bridge, and continue to follow this horse trail as it takes you back along the Going To The Sun Road and eventually leads you to your vehicle that's parked at the Johns Lake Trailhead, which is where you initially began this Glacier Park hiking adventure. McDonald Creek Trail along the Johns Lake Loop Trail in Glacier National Park. This is a view of McDonald Creek and McDonald Falls from the North Shore Lake McDonald Road bridge in Glacier National Park. Note: This is not our favorite hike in Glacier National Park. 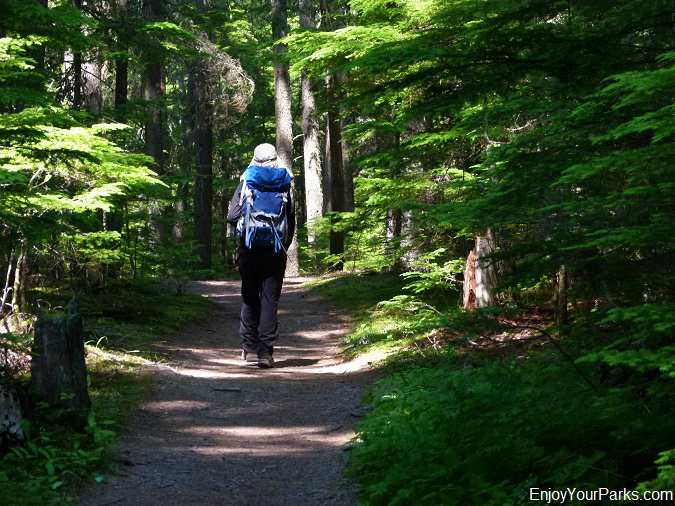 Make sure you hike the trails on our Favorite Day Hikes list and our Favorite Easy Day Hikes list before considering the Johns Lake Loop Trail. 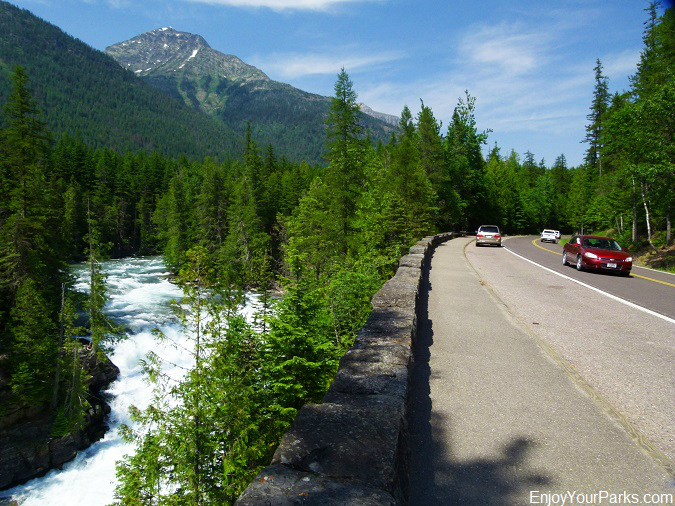 And remember, you can see Sacred Dancing Cascade, McDonald Creek and McDonald Falls from the Going To The Sun Road, and there are pullouts for all of these attractions.